Here we have a Parker Slimfold fountain pen in red with gold-plated trim; the pen is a squeezy-filler and needs ink from a bottle; the nib is a broad grade 14ct gold and it writes nicely and will function nicely too. Here we have a Parker Demi Duofold fountain pen in blue with gold-plated trim; the pen is a squeezy-filler and needs ink from a bottle; the nib is a medium grade 14ct gold and it writes nicely and will function nicely too. Here we have a Parker 17 Lady fountain pen and pencil set in green with gold-plated trim; the pen is a squeezy-filler and needs ink from a bottle; the nib is a medium grade 14ct gold and it writes nicely and will function nicely too. 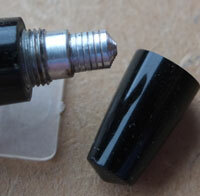 The pencil has spare leads and part-used eraser. Here we have a Parker 17 fountain pen in green with gold-plated trim; the pen is a squeezy-filler and needs ink from a bottle; the nib is a medium grade 14ct gold and it writes nicely and will function nicely too. Here we have a Parker 17 fountain pen in blue with gold-plated trim; the pen is a squeezy-filler and needs ink from a bottle; the nib is a fine grade 14ct gold and it writes nicely and will function nicely too. Here we have a Stephens 106 fountain pen in black with gold-plated trim; the pen is a lever-filler and needs ink from a bottle; the nib is a medium grade 14ct gold and it writes nicely and will function nicely too. Here we have a Swan eyedropper fountain pen in black hard rubber (vulcanite); the pen is filled with a pipette from a bottle; the nib is a fine grade 14ct gold and it writes nicely. Here we have a Swan eyedropper fountain pen in black with gold-plated bands; the pen is filled with a pipette from a bottle; the nib is a medium grade 14ct gold and it writes nicely with a little flexibility. Here we have a Parker Slimfold fountain pen in black with gold-plated trim; the pen is a squeezy-filler and needs ink from a bottle; the nib is a fine grade 14ct gold and it writes nicely and will function nicely too. Here we have a Parker Demi Duofold fountain pen in black with gold-plated trim; the pen is a squeezy-filler and needs ink from a bottle; the nib is a medium grade 14ct gold and it writes nicely and will function nicely too. Here we have a Mentmore Auto-flow fountain pen in blue and black with gold-plated trim; the pen is a button-filler and needs ink from a bottle; the nib is a medium grade 14ct gold and it writes nicely and will function nicely too. This is an inexpensive basic very-reliable everyday pen that will last for years. Here we have a Mentmore Auto-flow fountain pen in golds and browns with gold-plated trim; the pen is a button-filler and needs ink from a bottle; the nib is a medium grade 14ct gold and it writes nicely and will function nicely too. This is an inexpensive basic very-reliable everyday pen that will last for years. Here we have a Sheaffer Lady IX fountain pen in red and gold 'Tulle' pattern Chinese Lacquer; the pen is a cartridge or converter-filler and, at present, with the converter fitted needs ink from a bottle; the nib is a fine grade and it writes nicely and will function nicely too. Here we have a Parker 51 fountain pen in grey with a lustaloy cap; the pen is a squeezy-filler and needs ink from a bottle; the nib is a fine grade 14ct gold and it writes nicely and will function nicely too. Here we have a Parker Junior fountain pen in red with gold-plated trim; the pen is a squeezy-filler and needs ink from a bottle; the nib is a medium grade 14ct gold and it writes nicely and will function nicely too. Here we have a Parker Duofold fountain pen in black with gold-plated trim; the pen is a squeezy-filler and needs ink from a bottle; the nib is a medium grade 14ct gold and it writes nicely and will function nicely too. Here we have an early Conway Stewart 286 fountain pen in black chased finish with gold-plated trim; the pen is a lever-filler and needs ink from a bottle; the nib is a medium grade 14ct gold and it writes nicely and will function nicely too. The chasing has worn on both the cap and the barrel but otherwise its good. Here we have a Parker Insignia ballpoint pen in matt black with gold-plated trim; the pen is in working order and lightly used condition; it writes nicely and will function nicely too. Here we have a Parker 75 ballpoint pen in chocolate brown with gold-plated trim; the pen is in working order and lightly used condition; the pen writes nicely and will function nicely too. Here we have a used but good condition Yard-o-led pencil in rolled silver with matching clip; the pencil has spare leads in its magazine and writes nicely and will function nicely too. Here we have a Swan 1-SF fountain pen in black with gold-plated lever; the pen is a lever-filler and needs ink from a bottle; the nib is a medium grade 14ct gold No.1 and it writes nicely; the pen will function nicely too. Here we have a Swan SM100/60 fountain pen in black which is the clipless type; the pen is a lever-filler and needs ink from a bottle; the nib is a fine grade 14ct gold No.1 and it is quite flexible; the pen writes nicely and will function nicely too. Here we have a Swan 'Self-filler' fountain pen in black with nickel-plated clip; the pen is a lever-filler and needs ink from a bottle; the nib is a fine grade 14ct gold and it writes nicely and will function nicely too. Here we have a Swan 200 Series eye-dropper fountain pen in black with a fine grade 14ct gold semi-flex nib; it writes nicely; the cap is engraved '200' whilst the barrel end is engraved '203 FINE'. Here we have a Swan Blackbird fountain pen in black with nickel-plated lever; the pen is a lever-filler and needs ink from a bottle; the nib is a fine grade 14ct gold and is very flexible; it writes nicely and will function nicely too; its in super condition. Here we have a Conway Stewart 15 fountain pen in black with nickel-plated trim; the pen is a lever-filler and needs ink from a bottle; the nib is a fine grade 14ct gold and it writes nicely and will function nicely too; its boxed with leaflet and is in super condition. Here we have a Waterman W5 fountain pen in black with gold-plated trim; the pen is a lever-filler and needs ink from a bottle; the nib is a broad grade 14ct gold and it writes nicely and will function nicely too; there is wear where the cap fits and where it has been posted. Here we have a Parker Duofold fountain pen in grey with gold-plated trim; the pen is a button-filler and needs ink from a bottle; the nib is a broad oblique grade 14ct gold and it writes nicely and will function nicely too; there is a little variation in shading between the cap, the barrel, and the blind cap. Here we have a Conway Stewart Shorthand fountain pen in black with gold-plated trim; the pen is a squeezy-filler and needs ink from a bottle; the nib is a fine grade 14ct gold Shorthand 3L and it writes nicely and will function nicely too. 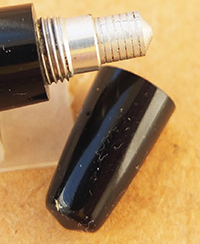 The top of the cap has a green clip-screw indicating that it is a Shorthand pen. Here we have a Wyvern 60C fountain pen in black with gold-plated trim; the pen is a lever-filler and needs ink from a bottle; the nib is a medium grade 14ct gold and it writes nicely and will function nicely too. Here we have a Parker Duofold fountain pen in black with gold-plated trim; the pen is a button-filler and needs ink from a bottle; the nib is a medium grade 14ct gold and it writes nicely and will function nicely too. Here we have a Parker Duofold fountain pen in blue with gold-plated trim; the pen is a squeezy-filler and needs ink from a bottle; the nib is a fine grade 14ct gold and it writes nicely and will function nicely too. Here we have a Summit fountain pen in green and black marble with gold-plated trim; the pen is a lever-filler and needs ink from a bottle; the nib is a medium grade 14ct gold and it writes nicely and will function nicely too. Here we have a Penol fountain pen in green and black marble with gold-plated trim; the pen is a button-filler and needs ink from a bottle; the nib is a fine grade 14ct gold and it writes nicely and will function nicely too. Here we have a Waterman fountain pen in black with gold-plated trim; the pen is a lever-filler and needs ink from a bottle; the nib is a medium grade 14ct gold NW2 and it writes nicely and will function nicely too. Here we have a Sheaffer Targa fountain pen in brushed steel with gold-plated trim; the pen is a cartridge or converter-filler and has a converter fitted; it needs ink from a bottle; the nib is a fine grade 14ct gold and it writes nicely and will function nicely too. Here we have a Mont Blanc Monta Rosa fountain pen in black with gold-plated trim; the pen is a piston-filler and needs ink from a bottle; the nib is a broad oblique grade steel and it writes nicely and will function nicely too; there is a spot of corrosion on the top of the nib. Here we have a Yard-o-led pencil in rolled gold with gold-plated trim; the pencil is in working order with spare leads in the magazine; its in very nice condition with no dings and no plating wear; it writes nicely and will function nicely too. Here we have a Cross fountain pen in matt black with gold-plated trim; the pen is a cartridge or converter-filler and has a converter fitted; the nib is a medium grade and writes nicely and will function nicely too. Here we have a Cross fountain pen in matt black with gold-plated trim; the pen is a cartridge or converter-filler and has a converter fitted; the nib is a fine grade and writes nicely and will function nicely too. Here we have a Waterman fountain pen in black with gold-plated trim; the pen is a cartridge or converter-filler and has a converter fitted; the nib is a medium grade 18ct gold and it writes nicely and will function nicely too. Here we have a Conway Stewart Dinkie fountain pen in black with gold-plated trim; the pen is a lever-filler and needs ink from a bottle; the nib is a fine grade 14ct gold and it writes nicely and will function nicely too. Here we have a Waterman red ripple pencil in red and black hard rubber with gold-plated trim; the pencil has spare leads in the magazine. Here we have a Parker Duofold pencil in red and black marble with gold-plated trim; the pencil has spare leads and a new eraser; it writes nicely and will function nicely too. Here we have a Sheaffer fountain pen in red with gold-plated trim; the pen is a cartridge or converter-filler and has a converter fitted; the nib is a fine grade and writes nicely and will function nicely too. Here we have an early Conway Stewart fountain pen in black chased finish with gold-plated trim; the pen is a lever-filler and needs ink from a bottle; the nib is a medium grade 14ct gold and it writes nicely and will function nicely too. Here we have a Sheaffer Lady fountain pen in greeny gold colour with gold-plated trim; the pen is a cartridge or converter-filler and has a converter fitted; the nib is a medium grade 14ct gold and it writes nicely and will function nicely too. PS. this pen comes with a few cartridges. Here we have a Wyvern Perfect No.81 fountain pen in black with gold-plated trim; the pen is a lever-filler and needs ink from a bottle; the nib is a medium grade 14ct gold and it writes nicely and will function nicely too. Here we have a Conway Stewart 75 fountain pen in black with nickel-plated trim; the pen is a lever-filler and needs ink from a bottle; the nib is a medium grade 14ct gold and it writes nicely and will function nicely too. Here we have a Parker Vacumatic fountain pen in silver pearl with nickel-plated trim; the pen is a vacuum-filler and needs ink from a bottle; the nib is a fine grade 14ct gold single colour and it writes nicely and will function nicely too. Here we have a Parker 45 fountain pen in brushed steel with gold-plated trim; the pen is a cartridge or converter-filler and has a converter fitted; it needs ink from a bottle; the nib is a broad grade 14ct gold and it writes nicely and will function nicely too. 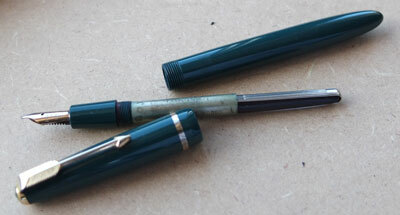 Here we have a Parker Junior Duofold fountain pen in green with gold-plated trim; the pen is a squeezy-filler and needs ink from a bottle; the nib is a medium grade 14ct gold and it writes nicely and will function nicely too. Here we have a Parker 17 fountain pen in blue with gold-plated trim; the pen is a squeezy-filler and needs ink from a bottle; the nib is a medium grade 14ct gold and it writes nicely and will function nicely too. Here we have a Parker Duofold fountain pen in black with gold-plated trim; the pen is a button-filler and needs ink from a bottle; the nib is an extra-fine grade 14ct gold and it writes nicely and will function nicely too. Here we have a Parker Junior Duofold fountain pen in blue with gold-plated trim; the pen is a squeezy-filler and needs ink from a bottle; the nib is a medium grade 14ct gold and it writes nicely and will function nicely too. Here we have a Parker 61 fountain pen in black with a lustaloy cap and gold-plated trim; the pen is a cartridge or converter-filler and has a converter fitted; the nib is a 14ct gold medium grade that writes nicely and will function nicely too. Here we have a Conway Stewart 388 fountain pen in red and black marble with gold-plated trim; the pen is a lever-filler and has a medium grade 14ct gold nib that writes nicely and will function nicely too. Here we have a Conway Stewart 84 fountain pen in black with gold-plated trim; the pen is a lever-filler and has a medium grade 14ct gold nib that writes nicely and will function nicely too. Here we have a Waterman W2 fountain pen in black with gold-plated trim; the pen is a lever-filler and has a medium grade 14ct gold nib that writes nicely and will function nicely too. Here we have a Waterman ballpoint pen in brushes steel with gold-plated trim; this pen has been used so has a few marks but no dents or splits and will function nicely. Here we have a Parker Lady Duofold fountain pen in blue with gold-plated trim; the pen is a squeezy-filler and has a broad grade 14ct gold nib that writes nicely and will function nicely too. Here we have a very nice condition Parker Duofold fountain pen in red with gold-plated trim; the pen is a squeezy-filler and has a medium grade nib that writes nicely and will function nicely too; this is quite a big pen and I have seen it marked Duofold Senior. Here we have a Colibri fountain pen in gold-plated finish; the pen is a cartridge or converter-filler and has a converter fitted; the nib is a fine grade and writes nicely. Here we have a Parker 17 fountain pen in black with gold-plated trim; the pen is a squeezy-filler and has a medium grade nib that writes nicely and will function nicely too. Here we have a Waterman CF ballpoint pen in brushed steel with chrome trim; the pen has a new refill and a spare new refill; replacdement refills are now available form Custom Pen Parts. Here we have a Parker Junior Duofold fountain pen in blue with gold-plated trim; the pen is a squeezy-filler and needs ink from a bottle; the nib is a medium grade 14ct gold No. 10 that writes nicely and will function nicely too. Here we have a Parker Slimfold fountain pen in black with gold-plated trim; the pen is a squeezy-filler and has a medium grade 14ct gold nib that writes nicely; this pen has been used so has a few small marks but is in good mechanical condition so will last for years to come. Here we have a Parker 17 fountain pen in blue with gold-plated trim; the pen is a squeezy-filler and has a medium grade 14ct gold nib that writes nicely; it will function nicely and comes in its original box with leaflet too. Here we have a Parker Duofold fountain pen in black with gold-plated trim; the pen is a button-filler and needs ink from a bottle; the nib is a medium grade 14ct gold and writes nicely and will function nicely too. Here we have a Sheaffer Targa fountain pen in black with gold-plated trim; the pen is a cartridge or converter-filler and has a converter fitted; the nib is a medium grade 14ct gold that writes nicely and will function nicely too; it is a bit worn. Here we have a Parker fountain pen in black with gold-plated trim; the pen is a cartridge or converter-filler and has a converter fitted; the nib is a broad grade; it writes nicely and will function nicely too. Here we have a Parker Victory fountain pen in black with gold-plated trim; the pen is a button-filler and needs ink from a bottle; the nib is a medium grade 14ct gold that writes nicely and will function nicely too. Here we have a Waterman fountain pen in green and black marble with gold-plated trim; the pen is a lever-filler and needs ink from a bottle; the nib is a fine grade 14ct gold No. W-2A; it writes nicely and will function nicely too. Here we have a Waterman fountain pen in black with gold-plated trim; the pen is a lever-filler and needs ink from a bottle; the nib is a medium grade 14ct gold No.2A; it writes nicely and will function nicely too. Here we have a super-condition Parker 17 Super fountain pen and pencil set in black with gold-plated trim; the pen is a squeezy-filler and has a medium grade nib that writes nicely and will function nicely too; its boxed too. The pencil has spare leads and a new eraser. Here we have a Parker Slimfold fountain pen in black with gold-plated trim; the pen is a squeezy-filler and has a medium grade 14ct gold nib that writes nicely and will function nicely too. Here we have a lightly-used Parker 17 Super fountain pen in black with gold-plated trim; the pen is a squeezy-filler and needs ink from a bottle; the nib is a medium grade 14ct gold that has a little flexibility; it writes nicely and will function nicely too. Here we have a Parker Junior Duofold fountain pen in green with gold-plated trim; the pen is a squeezy-filler and has a medium grade 14ct gold nib that writes nicely and will function nicely too; very reliable. 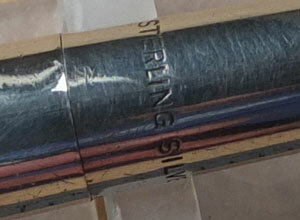 Here we have a Sheaffer Touch-down fountain pen in gold electroplated finish; the pen is a cartridge or converter-filler and has a converter fitted; the nib is a 14ct gold medium grade that writes nicely and will function nicely too; there is a small ding towards the bottom end of the barrel. Here we have a Sheaffer Imperial Touchdown fountain pen in blue with gold-plated trim; the pen is a piston-filler and has a medium grade two-colour nib that writes nicely and will function nicely too. 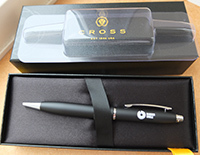 Here we have a Cross fountain pen in black with nickel-plated trim; the pen is a cartridge or converter-filler and has a cartridge fitted; the nib is a medium grade that writes nicely and will function nicely too; this pen is virtually mint but has arubbed spot on the cap. Here we have a Waterman rollerball pen in brushed steel with gold-plated trim; the pen has hardly been used so is in lovely condition and will function nicely too. Here we have a Parker 17 fountain pen in red with gold-plated trim; the pen is a squeezy-filler and has a medium grade 14ct gold nib that writes nicely and will function nicely too. Here we have a Parker Lady fountain pen in black with gold-plated trim; the pen is a squeezy-filler and has a broad grade 14ct gold nib that writes nicely and will function nicely too. Here we have a Parker Victory fountain pen in blue with gold-plated trim; the pen is a squeezy-filler and has a medium grade 14ct gold No.10-9 nib that writes nicely and will function nicely too. Here we have a Parker 61/65 Insignia ballpoint pen in gold-filled finish; the pen writes nicely and will function nicely too. Here we have a very nice Waterman fountain pen in black with gold-filled trim; the pen has a medium grade 14ct gold No.2A nib and functions nicely; the lever is a little pitted but the rest is good. Here we have a nice Conway Stewart 75 fountain pen in green marble with nickel-plated trim; the pen has a medium grade 14ct gold nib and will function nicely. Here we have a lightly-used Waterman fountain pen in dark green and in lovely condition; the pen has a 14ct gold W3 medium grade14ct gold nib which is lovely to write with; please be aware there is some pitting to the lever. Here we have a lightly-used Blackbird fountain pen in black and in lovely condition; the pen has a 14ct gold broad grade nib which is lovely to write with; the pen does have a few small marks consistent with 50 years of careful handling. Here we have a used Cross fountain pen in nice condition apart from a name engraved on the cap and a few signs of 20 years of reasonable use; the pen has a 14ct gold medium grade nib. 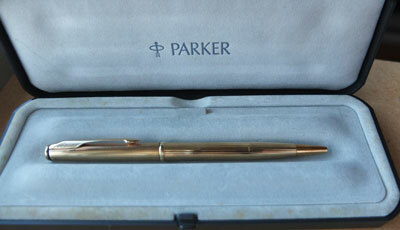 Here we have a rather nice, probably unused, Parker ballpoint pen in gold-filled finish and boxed too; the pen would make a nice gift for a loved one. Here we have a Parker 45 fountain pen in grey with a lustaloy cap and chrome clip; the pen dates from around 1965; the pen has a fine grade 14ct gold nib and writes nicely; the plating is good and apart from a few small marks the body and cap are good too. 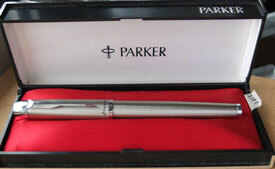 Here we have a Parker fountain pen that has been used but very little; the pen uses cartridges or a converter and there is a converter fitted; the nib is a medium grade and writes nicely. A very functional mechanically-sound Parker Junior Duofold fountain pen in blue with gold-filled trim; the pen has a 14ct gold fine grade No.10 nib and writes nicely; the pen is a squeezy-filler and needs ink from a bottle; the imprint on the barrel is thin but readable. A very functional mechanically-sound Parker 17 Super fountain pen in blue with gold-filled trim; the pen has a 14ct gold medium grade hooded nib and writes nicely; the pen is a squeezy-filler and needs ink from a bottle; the imprint on the barrel is absent. A very functional mechanically-sound Conway Stewart No.18 pencil; the pencil has spare leads and a hardened eraser. A very functional mechanically-sound Sheaffer Targa fountain pen; the pen is the slim version and has a 14ct gold fine grade nib and writes nicely; the pen uses cartridges or a converter and a pack of cartridges is supplied; this pen has been used but could be a good everyday pen. A mechanically-sound but used very nice Waterman W2 fountain pen in grey with gold-plated trim; it has a broad grade 14ct gold No.2A nib and writes nicely; there is just a little pitting on the lever and a little plating wear on the clip but the band is good. A mechanically-sound but used very nice Cross Diary pencil in Sterling Silver; it writes nicely and has spare leads and a new eraser. A mechanically-sound but used very nice Eversharp clutch pencil in Sterling Silver finish with silver-plated trim; it writes nicely and has spare leads and a new eraser. A mechanically-sound but used very nice Parker Insignia pencil in bright steel finish with gold-filled trim; this uses 0.5mm leads; it writes nicely and has spare leads and a soft eraser. A A mechanically-sound but used very nice Waterman pencil in blue laque finish with gold-filled trim; it uses 0.5mm leads and writes nicely; it has spare leads and a new eraser; it does have 'Leven UK' lightly stencilled on it. A mechanically-sound very nice and very functional Parker Slimfold fountain pen in black with gold electroplated trim; the pen is a squeezy-filler and has a 14ct gold medium grade nib; this is a very nice pen but the imprint on the barrel is worn; it writes nicely. A lightly-used but nice-condition very-functional Sheaffer 925 Sea-Spray fountain pen in rhodium-plate with a 14ct gold medium grade 'thumb-nail nib; this is a cartridge or converter-filler with a converter fitted and it writes nicely too. 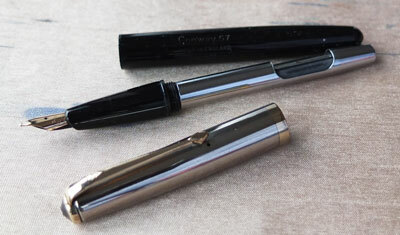 A used but very functional Sheaffer Imperial fountain pen in black with a brushed steel cap; the pen is shown alongside a Sheaffer PFM for sizing purposes; the PFM is not included in this sale but is available separately on my Sheaffer page; this pen is a cartridge or converter-filler and has a converter fitted; the pen has a fine grade nib and it writes nicely. A used but very functional Sheaffer fountain pen in gold electroplated finish; the pen is a cartridge or converter-filler and has a converter fitted; the pen has a medium grade nib and writes nicely; there is just a little plating wear on the clip but no dents or serious scratches. A very nice black Sheaffer snorkel with the conventional nib with gold filled trim; the pen has a medium grade two-colour nib and writes nicely; this pen has been used but is still in lovely condition; no cracks, splits or severe marks.